The following is the eulogy that Darcy Farrell (TVW’s first News Editor) gave at Bob Cribb’s funeral on December 5th, 2008. Darcy believes that in the overall TVW7 story Bob should be remembered as a valuable pioneer who, more than anything, was a colourful character. I spoke to Bob just a couple of days before he passed away. He stoically told me not to worry too much about him because, as he put it, there were many people far worse off than he was. It was typical true grit from Bob at a time of ultimate adversity. Cribby’s life, as you have just heard from Reg, was a real adventure. It was a journey which all of us here today shared in one way or another. I first saw Bob when he was a young cadet at West Australian Newspapers. He was clean cut. He was exuberant. He was larger than life. Little did I know then that we would spend a great deal of time together and, like you all, I was to enjoy the ups and downs, the fun, the humour and, I guess, the drama of Bob’s life. In a professional sense, Bob had that rare quality in journalism of good news judgment. He was quick to seize on a story or an event or a topic of human interest. Bob saw things clearly and he was an ideas man. He was ready-made to work in television and he became an integral part of our News team at Channel Seven. However, his on-camera debut didn’t exactly go to plan. Bob had left the West and worked in Melbourne reporting footy for the Herald group. When he returned to Perth in the early 1960s he impressed us at Seven with his confidence and he convinced us he should be presenting football on television. We ran a program called Sport at Seven, hosted by Syd Donovan and Frank Bird. “Tonight we are introducing a new member to our football team. “Bob Cribb is just back from Melbourne where he reported on the VFL. Bob looked earnestly into the camera and began. His voice carried that sense of urgency and resonance. Rick Ardon would have envied Bob’s professional poise. Bob continued superbly for about 30 seconds. Then he looked up from his notes and eyeballed the camera. Taking his eyes off the notes proved to be disastrous. Bob’s jaw dropped, his mouth was agape. Not another word fell from his lips. Remember in the early days of television everyone in Perth was watching Seven. The agonising hush could be felt in every TV home. The viewers were glued to their sets as Bob sat motionless peering into the cruel lens of a cold and unforgiving camera. Eventually, Syd relieved the situation by engaging Bob in a question and answer session. That was Bob’s first – and only – appearance as a live match day reporter. I don’t need to tell you that Bob went on to become a great behind the scenes man whose contribution to the football and sporting programs was outstanding. He did appear on television after that Sport at Seven incident, but it was mainly in News reporting and only a couple of weeks ago Seven showed the excellent Manhunt feature in which Bob was the central figure. On that segment Bob became quite famous in journalism for his comment and I quote “the man dog killer is holed up in this bush”. In those days comments of that type were deemed to be sub-judice and contempt of court. Needless to say, both Bob and Seven were both sued for contempt and the defence lawyer, Dr Marian I think it was, used Bob as the scapegoat to try to get an acquittal. Today, reporters say pretty well what they like. By modern standards Bob’s words on that Sunday at the Gnangara pine plantation were quite mild. Bob was reporting ad lib for more than three hours using primitive equipment which was the equivalent of flying a tiger moth compared to today’s F 18 jets. He had to fly by the seat of his pants ad libbing his way through an event of enormous local interest. Peter Kennedy referred to the manhunt on 720 this morning when he paid tribute to Bob. I consider Bob’s on camera performance on that day almost half a century ago was a remarkable effort and few of today’s reporters could emulate it. Bob was ahead of his time when he suggested to Seven that it should cover the Sandover Medal. In the early 1960s, the Medal was counted behind closed doors and the result was reported the next day in The West or Ollie Drake Brockman put out a newsflash on radio. Bob arranged for the six players he thought could win the medal to be on standby to come to the studios at Tuart Hill. Among them was the winner, Neville Beard, and Bob had Neville being interviewed live on Seven within minutes of the Sandover count. It was a real coup for Bob and Seven. Subsequently, Bob got Barry Cable live after Cabes won the medal. It was at Bob’s behest that Seven went on to do the live telecast of the medal count and it has been replicated in Melbourne as the AFL’s major social event, the Brownlow. Bob Cribb thought of it first. Bob was also ahead of his time in recognising the great comedy talent of John Watts. Bob produced the J K Watts segments and became Wattsie’s manager. To this day, I’m still not sure who benefited the most: Wattsie or Cribbie? Bob had some amazing contacts and unearthed stories long before other more experienced newspeople. For example, he came to me one day and told me the police had found a rifle hidden in the grass verge of a suburban home in Mt Pleasant. The police were staking out the area and were fearful that if the information leaked the man they wanted would be alerted. I am referring, of course, to the Cooke case. Bob got the information first, even ahead of the legenday Daily News police roundsman Jack Coulter, because he knew the people living in the adjacent Mt Pleasant property. Together Bob and I decided that for the good of the community we would keep the information under wraps. Cooke was caught and I think Bob should be commended for never revealing the vital information which would have given him a national scoop. When there was a state of emergency in Brunei in 1962, we sent Bob to cover the attempted coup. It was a dangerous situation and no one was allowed on the streets after dark. I’m sure his family doesn’t know this, but in his attempt to get the story Bob broke the curfew and a British officer pulled his pistol and gave Bob one minute to get off the streets. In one minute you will be shot, the intrepid boy from Belmont was told. Bob covered the 200 metres back to his hotel at Olympic speed. But as we all know Bob’s life wasn’t all drama. Bob and his group were fun loving hedonists who could have walked straight out of Damon Runyon’s Guys and Dolls. At the Charles Hotel you would find Bob with mine host Jack Sheedy, J.K Watts, Tom Everett, Mal McGrath, Jack Woolcock, Murray, Kevin, who is here today, Ted, Theo, occasionally Nugget Hilz and an entourage of other interesting characters. To give you an idea of the colourful times, Mal McGrath wore a pink suit one day and a green suit the next and he drove Bob and the others around in the biggest Cadillac in Australia. If Bob and his group weren’t at the Charles you’d find them at the John Barleycorn playing darts or pool with Gerry Bahen, Brian Treasure and many others. If Bob wasn’t at the Charles or the Barley there was a better than even chance you’d find him trackside at Ascot. I hired Bob three or four times and I sacked him three or four times. Even when I sacked him there were no hard feelings. When I arrived at the station at 3pm one Sunday afternoon I couldn’t find anyone. The newsroom was empty. The place was deserted. Bob had recorded the news four hours before it was due to go to air and sent the staff home. Bob himself had gone off to a party. If World War 111 had happened that day our viewers would never have known. But Bob assured me it was a great party and worth getting the sack. There are so many stories about Bob. I’m sure everyone here today will have their own personal anecdotes. Maxine and Bob’s family will cherish the memory of Bob’s warmth and wonderful sense of humour, his love and affection. He should be remembered for his fine contribution to television in this State in its pioneering days. I was speaking with Bill McKenzie, one of WA’s best ever television executives, and he concurred that Bob’s work on sporting and news programs was of major importance in the evolution of TV in this State. Bob was innovative and worked with vigour and vision. And Bob should be remembered as a great friend of football. His efforts on behalf of Australian football and on behalf of footballers were superb. There were many major milestones marking Bob’s journey of life. Let’s give thanks that we knew him and were lucky enough to have shared so many of those landmark experiences. Your http://watvhistory.com/2009/03/bob-cribb-tribute website is great! 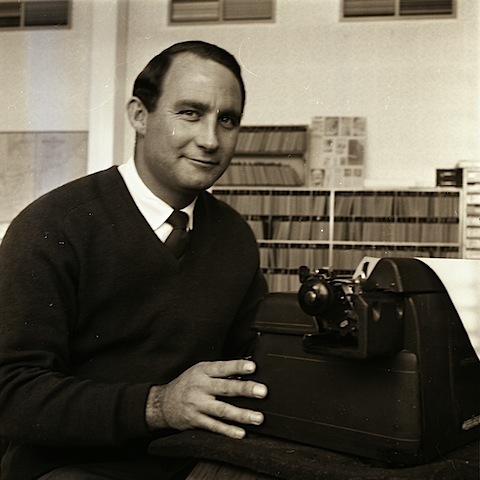 You told in Western Australian Television History (WA TV History) » Blog Archive » Bob Cribb Tribute some trues, but i must agree, you can more.